EU Commission indexes fell to 110.9 in September from 111.6 in August. 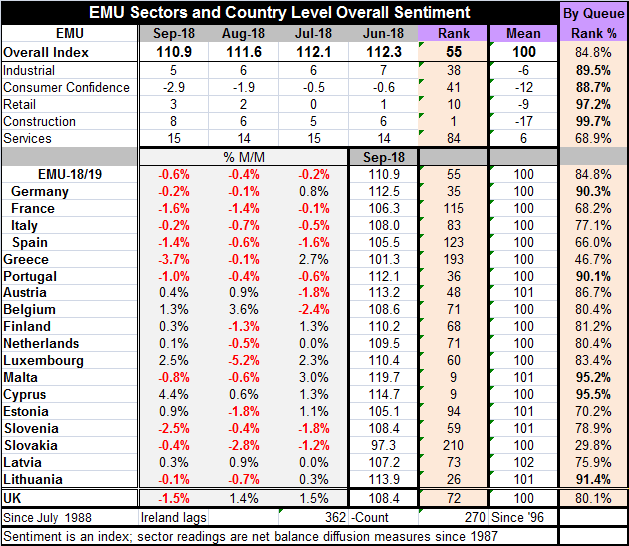 Among the 18 early reporting EMU nations, 10 showed month-to-month declines in their sentiment indexes including each one of the largest four economies. ‘Big four' economies have seen their indexes fall for two months running. The overall EU measure is still strong. It stands at the 84th percentile of its historic queue of values with high 90th percentile standings by the construction sector and retail sector. The industrial sector and consumer confidence have high 80th percentile standings. The services sector sports a weaker high 60th percentile standing. No sector is truly weak. Sentiment readings are still largely very solid and strong across members By country, five have 90th percentile queue standings. Another five have 80th percentile standings. Four have 70th percentile standings. Two have 60th percentile standings. Two have standings below their respective 50th percentile (Greece and Slovakia). On balance, the firmness and strength in the EMU are well balanced across the area's membership. Over half of the reporting countries have rankings in the top 20 percentile of their historic queue of data while only two countries have readings below their historic medians. Ten countries show EMU indexes that are declining over three months, six months and 12 months; they are France, Italy Spain, Portugal, Austria, the Netherlands, Slovenia, Slovakia, Hungary, and Bulgaria. Only Belgium and Malta show increases over all three horizons. Obviously, the erosion is relatively widespread despite the counter-fact that the levels of sentiment remain quite high and solid across the community. Another key report from today's calendar is the money and credit profile in August for the EMU. That report shows money supply demonstrating a trend softening along-side a stunted pace of private credit. If we deflate these series to express them in real terms, real money balances are slowing and real credit is contracting and contracting at a faster pace. Putting together with the widespread slowing in the EMU signaled by the EU Commission indexes, this would seem to be a powerful wake-up call for those seeking rate hikes in the EMU. But apparently, it is not. I have today read reports of how the early release of the German CPI has pushed inflation to 2.2% year-over-year in Germany and how that fully justifies the ECB plan to leg out of its liquidity program. Clearly, this is a German view. The ECB makes policy for the whole EMU, not just Germany. The last time I looked, the ECB was not a subsidiary of the Bundesbank, but in Europe almost anything is possible these days. The German CPI gain is excessive on a one-month surge in its price index, a spurt we cannot analyze until we get the CPI detail. And I doubt that the rest of Europe suffered the same one-month surge at the same time. CPI surges tend to be idiosyncratic. The trending erosion of the EU indexes seems much more pertinent than a one-month CPI pop in a single EMU member - a pop that could reverse - along with the ongoing pull back in EMU-wide money and credit there are important signals flashing a warning to those who would pull the plug on stimulus. EMU trends are moving in a way opposite from the trends in the U.S. where the Federal Reserve just hiked rates again yesterday. EMU trends will call the policy tune for the ECB. Clearly, the ECB is ready to move on from a policy of protracted ease. It would like to forecast a brighter future and a stronger pace of inflation and use that as a basis to move ahead with policy normalization. But it is far from clear that such a choice is on the menu. And Europe still has Italy to deal with and the U.K. looks more and more like it will be part of a Brexit negative shock since Europe seems disinclined to make policy with the U.K. based on its historic importance and seems more willing to want to rub its nose in a decision that the EU has found to be profoundly embarrassing. Because of these circumstances, Europe's future is very much up in the air. Flipping the switch to less accommodation may not be as easy as it seemed a few months ago.